Turtlehead, White Turtlehead, Chelone glabra L.
Turtleheads have flowers where the upper lip arches over the lower lip giving the resemblance to a turtle's head. White Turtlehead is a native erect perennial forb growing on smooth 4-sided stems, usually about 2 to 3 feet high and usually unbranched below the inflorescence, but branched within. Stems are usually multiple from the root. 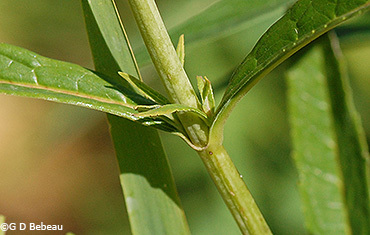 The inflorescence is a dense short spike at the top of the stem and on axillary stems from the upper leaf axils. Flowers open from the bottom to the top of the spike. The white flowers (can have a pink tinge) have two almost closed lips. The upper lip has two shallow lobes. The lower lip has three lobes with the center one bearded. 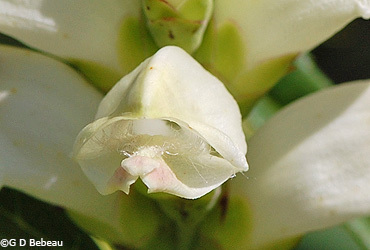 The flower tube is 1 to 1-1/2 inches long. Inside are 5 stamens and a style. The short style and four of the stamens that are true are appressed to the upper part of the corolla tube in pairs, almost joined, until forced apart by large bees. The pollen sacs of these stamens are covered with dense hairs. The fifth sometimes degenerated stamen (a staminode) is short and usually lies at the base of the tube. The green calyx has 5 ovate-oblong segments with rounded lobes. 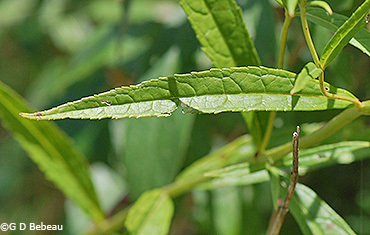 At the base of the calyx are several green bracts with smooth surfaces. The Chelone genus is protandrous, that is the male segments of the flower mature before the female parts. When the pollen sacs mature, attracting large bees, nectar production is low, but then the flower enters the female phase and the style, formerly recessed in the upper lobe, elongates and recurves downward, placing the stigma near the entrance to the corolla and in front of the anthers, thus picking up pollen from late pollen gathering bees as they leave the flower. These late bees are also now attracted by an increase in nectar projection. Thus Chelone even though it is protandros, can set seed from its own pollen (autogamous) but requires a later second visit by a pollen gathering bee to do so. (Reference below). Seed: Fertile flowers produce an ovoid seed capsule, twice as long as the calyx, containing flatten seeds that have wide wings for wind dispersal. Turtlehead seeds are best planted outdoors in the fall as the seeds need at least 120 days of cold stratification for germination. 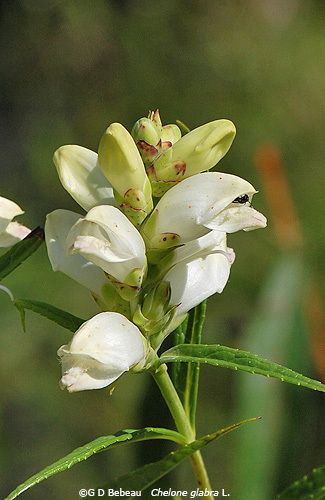 Habitat: Turtlehead grows from a rhizomatous root system which allows it to colonize. It requires fertile moist soil and full sun for stout plants. These plants appear in a few places in the bog area of Eloise Butler but are greatly outnumbered by the Red Turtlehead. Names: The genus name Chelone is Greek for 'tortoise' and the species name glabra means 'smooth' - no hair on the leaves or stem. The author name for the plant classification - 'L.' is for Carl Linnaeus (1707-1778), Swedish botanist and the developer of the binomial nomenclature of modern taxonomy. The newest reclassification puts this plant into the Plantaginaceae (Plantain) family and removes it from the Figwort (Scrophulariaceae) family. Comparison: Red Turtlehead, Chelone obliqua, has a similar flower, but pink in color and the leaves are distinctly different, being more ovate, a longer stalk and a different vein pattern. 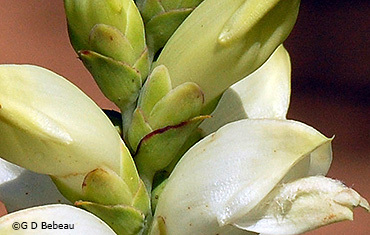 Above: Detail of the inflorescence. In the 2nd photo note the multiple spikes on branches from the main stem. Below: 1st photo - The upper stem leaves can be clasping have margins without teeth, while the lower stem leaves (2nd photo) have a very short stalk at the 4-angled stem, sharp teeth, and an intricate vein pattern. 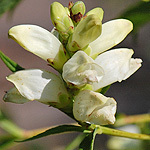 Notes: White Turtlehead is indigenous to the Garden area. Eloise Butler catalogued it on Sept 6, 1907. She obtained additional plants from Malden, Mass. in Sept. 1909. It is listed on Martha Crone's 1951 census of Garden Plants. She had also planted it in 1946. 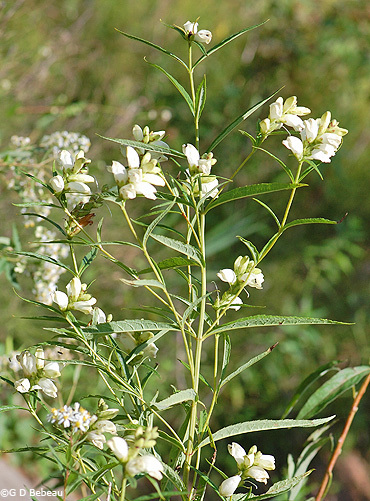 White Turtlehead is native to Minnesota in most counties in the East half of the State which marks the western edge of the plants range in the U.S. It is found in the eastern half of North America, from the Mississippi River eastward in the U.S. and Manitoba eastward in Canada. This is the only species of Chelone currently found in the wild in Minnesota.